A beautiful full-bodied aromatic special cuveé with intense fruit aromas and complex notes of ripe pears, apples, spice and oak....the perfect tipple with a plate of oysters. 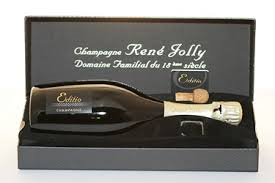 This is a family owned business since 1737 in Landreville, Côte des Bar, Champagne. "Our vineyard is situated in the heart of the village and we are independent : we don't buy in or use grapes from other producers (or wines) and we do not use any subcontractors. We look carefully after the vineyard (6 workers) and harvest ripe grapes. We grow Pinot Noir (75 %) and Chardonnay (25 %) and have a full range of Champagnes". A very attractive bouquet showing aromas of citrus, pears, ripe yellow apples, toast and biscuit with good acidity, fine bubbles and a concentrated prolonged nutty aftertaste made according to traditional methods.